Updated Writing: Back in 1982, I was working for NCR in Dayton, Ohio and doing my grad work at the University of Dayton. My instructor was a financial VP at NCR which made the course immediately at tad easier for me. Early in the semester, this instructor took a liking to me. It was probably our third or fourth class when he became somewhat philosophical, and even emotional, about a topic - he discussed the misuse of economic power. He did not discuss this from a technical viewpoint, but from social endgame viewpoint (remember, this was the early 80s - late baby boomers were flourishing - being a Yuppie was the in thing - it was the Reagan years - Round One). After class, he asked me to come to his office. There was something he wanted me to have. 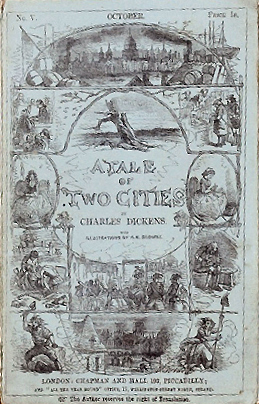 He handed me his marked up old copy of A Tale of Two Cities and said, "Bob, make sure you read this". It was about two years later, after reading it – that I put the puzzle pieces together. A Tale of Two Cities continued popularity is more about history repeating itself (IMO) than any economic theory or situation. Not enough people read, especially our youth, which is why we are destined to repeat our history again and again. Original Writing modified and expanded: I very rarely express a political opinions, but I believe our politicians are tying our hands behind our backs and then holding us responsible for scratching our bellies and fining us if we don't... I fear that in our lifetimes we will experience not only what we saw in Greece, but as an extreme, what we saw in Egypt (Note: Originally written in September 2012). It will not be the fault of one group, class, corporation, or party, but what we, as a people, ignorantly chose and even voted for. Thus it’s what we wanted. In spite of what we learn, how smart we are, and the wisdom we have - history continues to repeat itself - Read about, (or even READ) A Tale of Two Cities.